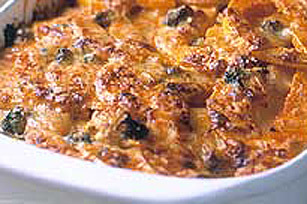 LAYER chopped broccoli and slices of potatoes and squash in a medium casserole dish. COMBINE 1 cup Kraft French Dressing, a few handfuls of Kraft 3 Cheese Blend for Casseroles Shredded Cheese and a few dashes of nutmeg and pour over vegetables. BAKE at 400°F for 30 minutes or until vegetables are tender.